Last weekend I knew my husband was REALLY looking forward to the Green Bay Packers playing the Chicago Bears, so I decided to make one of his favorite eat-in-front-of-Sunday-football meals: chili. 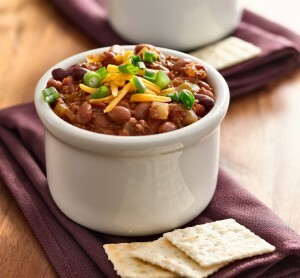 This can be a one-bowl dinner, though there are so many sides and snacks that go with chili that it is hard to resist temptation. My absolute favorite accompaniment is mashed potatoes, but corn bread, cheese and crackers, cheese quesadillas, or tortilla chips with guacamole are also great. (Dare I also suggest sangria, margaritas, or beer?) My kids like to sprinkle shredded cheddar on their chili. A dollop of sour cream adds creamy freshness to it, too. This recipe results in a fairly mild chili. You can adjust the hot pepper sauce as desired. As with all of my prior soup recipes, this makes a pile (10-12 servings) because I like leftovers. 40 oz. dark red kidney beans, undrained. Cook and stir ground meat, onion, and garlic in large saucepan until beef is browned. Drain fat. Stir in everything else but beans. Heat to boiling, reduce heat. Cover and simmer for 1-2 hours. Stir in beans. Heat to boiling, reduce heat. Simmer uncovered, stirring occasionally, at least 20 minutes and until it is the consistency you want. The chili worked, because the Packers are in the playoffs!